May 19, 2010. The day that gave most Juventini a renewed sense of hope. The day that made us believe that there is a glowing light at the end of a very dark tunnel. The day that saw the fourth Agnelli become the president of the most beautiful club in the world. Andrea Agnelli, the nephew of L’avvocato and the son of Umberto Agnelli, wasted no time in helping the club re-establish itself as one of the powerhouses in European football. One of his first acts was to oversee the Turin based side build their new stadium while also appointing the Sampdoria duo: Director General Giuseppe Marotta and his close associate, Fabio Paratici. Here we are right now, 5 years from the day. Standing on top in Italy, winning 4 successive Scudetti, one Coppa and two Super Coppa titles.Despite the pain that we had to endure while watching the most coveted Italian team lose out to Barcelona in the Champions League final last season, we can still be proud of the team making it to Berlin and giving their hearts out. However, that European campaign was really fruitful on the financial front. According to a report by calcioefinanza.it, Juventus made close to €30 million more than eventual winners Barcelona from Europe’s most prestigious competition. 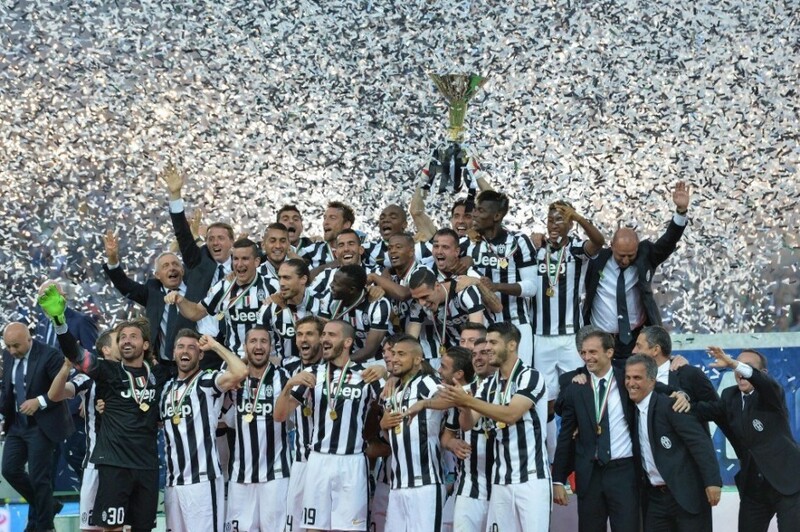 The Italian Champions reportedly made €86.9 million while the La Liga winners received €57.4 million. According to another report by La Gazzetta dello Sport, Juve have reportedly been able to make €320 million as revenues for the 2014-2015 season. These are outstanding figures that reflect the great work being done off the field by the management. Apart from these great revenues, Adidas are set to become the technical sponsors of Juve from the 2015-2016 campaign that involves a sponsorship of €139.5 million over 6 years. Jeep also renewed their partnership with Juve on a deal worth up to a maximum of €20 million per year for 6 years. According to a report by Tuttosport, La Madama will also collect €95 million from TV Viewership for the Serie A games in the 2015-2016 season. Reportedly, SKY Italia will also pay Juve €5 million to acquire rights for Juventus TV. Based on their success in the forthcoming Champions League season, Juve will also receive some amount of money from UEFA. Huge revenues collected by the company along with the money obtained from UEFA, new sponsorship and TV viewership deals indicate that there is no need to sell one of their crown jewels such as Paul Pogba or Arturo Vidal in the summer transfer window in order to strengthen the team. The club did exactly that by signing Paolo Dybala, Sami Khedira and Mario Mandzukic for a combined fee of €51 million excluding bonuses while exercising their option to redeem Roberto Pereyra for €14 million. Evidently, a total of €47.21 million is supposed to be paid as transfer fees and does not enforce a strenuous limit over the company’s budget in this mercato. Therefore, it isn’t strange that the 33 time Scudetto winners are reportedly on the verge of securing Sassuolo’s Domenico Berardi and Simone Zaza. According to a report by Sky Italia, La Vecchia Signora are in the market pursuing a trequartista. Juve coach Massimiliano Allegri has confessed his need for an attacking playmaker while also mentioning his liking for Oscar and Isco. You can get odds on transfer markets on Betfred. A report by Benedetto Minervo on Gianluca Di Marzio‘s website also indicated that Juve are seeking a playmaker not only for footballing reasons but also for commercial reasons. Carlos Tevez is set to join Boca Juniors this summer while there is still some skepticism over the future of Andrea Pirlo. Again, an additional transfer fee of €17.5 million to be paid this summer isn’t beyond the reach of a club that just crossed over €300 million in revenues. There is scope within the Juve budget to pay €64.71 million as transfer fees in this summer alone. There is also the matter of sales made by the club. Factually, Juve are supposed to receive a minimum of €16.39 million as transfer fees in the summer. This in addition to the probable €13 million that the club would receive due to sales in this summer, makes up a total of €29.39 million. Under these conditions, Juve will have a minimum net spend of €35.31 million. This is by no means a figure that could pose restrictions on the budget of the team that is speculated to be the most supported team across most European countries. Annual wages of €5.7 million will be saved if Pirlo, Llorente, Ogbonna and Storari leave the club. A total annual wages of €20.9 million can be saved under these conditions. However, there are going to be a few players that will be joining the squad. Daniele Rugani is reportedly coming back after his successful loan spell at Empoli while Juve are also reportedly on the verge of signing Fiorentina’s goalkeeper, Neto. Then, what is the approximate cost incurred as wages on the addition of Berardi, Rugani, Zaza and an established quality play maker to these two players? Annual wages of €10.2 million will be incurred on adding Berardi, Rugani, Zaza, Neto and an established playmaker. There’s also the matter of extending the contracts of the current members of the squad. These are most likely to involve an increase in annual wages for this summer. Annual wages of €4.3 million is added to the wage budget when the contracts of Bonucci, Allegri, Marchisio and Caceres are extended. Under the above conditions, there could be an addition of €14.5 million on the wage budget. When the club could potentially save annual wages of around to €20 million, an addition of €15 million poses a lesser challenge to control the wage budget. These also fall well within the limits of the wage budget that the club operate under despite adding an established quality playmaker to a list of potential arrivals and the extension of a few contracts. In all the cases, there is enough money available to invest in this season’s transfer market not only for a play maker but also for a full back. However, this isn’t exactly how Juventus account for transfers on their books while combating the Financial Fair Play Restrictions set by UEFA and also presenting a report to their investors. That is a discussion for another day. This is just a simple illustration of whether Juve can afford a world class established playmaker or not in this summer. With revenues expected to get close to €400 million for the next season, adding a playmaker this summer wouldn’t dampen the budget too much in the future. Most impressive aspect of this all is that the company is able to achieve these mercato targets without selling one of their own crown jewels. If the likes of Vidal and Pogba are eventually sold, that will not only add a lot of money to the transfer budget but it will also free up a lot of wages as they are two of the most earning members of the squad. Pogba will almost certainly be playing at the Euro’s and you can take a look here for betting on the final of euro. Evidently, it is no more a question of whether Juventus can afford to sign a world class established playmaker but it is rather a question of whether Juventus want to sign a world class established playmaker. 1. All transfer figures quoted have been taken from the price sensitive press releases available at Juve’s official website, unless stated otherwise. 2. All wage figures are based on reports from tsmplug, total sportek and Sky Italia. 3. A special mention to Ulrik Larsen(@Don_Ultrik), who helped in cross checking the tabulations.